Madison Quakers, Inc. has facilitated humanitarian projects in Quang Ngai province, since 1994. 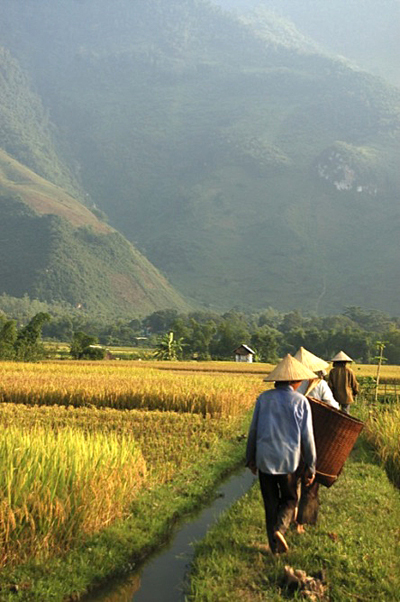 Quang Ngai province is one of the poorest provinces in Vietnam and is possibly the province dealing with the largest war legacy. Jonathan Schell published “The Military Half: An Account of destruction of Quang Ngai and Quang Tin.” in June, 1998. In this book Schell documents the destruction of seventy percent of all villages in Quang Ngai through, quite often, random artillery strikes, air strikes and naval bombardment. Unexploded ordinance still kills Vietnamese inhabitants of this province many of them children, three generations now are affected by Agent Orange and hatred runs rife. In addition to the legacies of the American war, the soil of the province has very low fertility and the seas contain fewer stocks of fish than other provinces in the region. Skepticism abounds by the province authorities who have seen foreigners come to Quang Ngai, make promises and never return. This is the setting in which Mike Boehm, on behalf of Madison Quakers, Inc., began developing humanitarian projects in 1994; poverty, suspicion and hatred. It takes time to gain the trust of the people of Quang Ngai and that could only be done by Mike returning to Quang Ngai over and over again. The result of this relationship building manifested itself in a speech to the media of Quang Ngai province by Mrs. Dinh Minh Oai, Vice-Chair of the Quang Ngai province People’s Committee. In this speech she told the media that we are the only organization that touch the people’s heart and that we are the only organization allowed to work with the ethnic people of the province. Since 1994, MQI has developed strong working relationships with the Quang Ngai province Women’s Union, the Vietnamese Association for Victims of Agent Orange (VAVA), the Veterans Association of Quang Ngai province, the Education Authorities of Quang Ngai and others. With these partners MQI has funded primary schools for My Lai, Compassion Houses for extremely poor women, veterans and victims of Agent Orange, the My Lai Peace Park, micro-credit loans for poor women and more.